Sun Baby high chair can be used for kids ranging from seven months to two years and above. The chair features a large removable tray that provides a lot of space and can be used well to place your baby's essentials like bottle, napkins, water and much more.The seat of this baby chair is made of PVC material that makes this chair more durable. The chair has a foam padded seat that keeps your baby comfortable even when seated for long hours. Thanks to the lightweight and portable design of this baby high chair, you can carry it even when you are going on long trips without any difficulty. 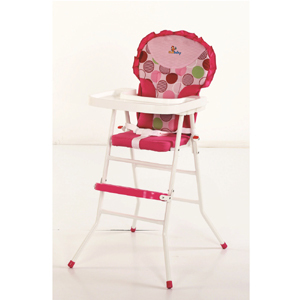 This Sun Baby High Chair is suitable for both boys and girls. Use it to place your kid's favourite toys during playtime or engage him with an activity book. To Recieve updates and possible rewards for Sunbaby SB-4217F Pink please sign in. To Recieve updates and possible rewards for High Chairs please sign in.